BC Beroe once again made a statement that it will be the team to beat at the Final Four in the first week of April in Tirana. The Greens won the Regular season in the Balkan League after downing KK Blokotehna 104-100 away. The game was a direct battle for the first place as the hosts needed to win by 11 points to get it. They managed to score enough to try but the visitors answered back with a more efficient offense to take the victory. Beroe finished the season with 11 wins and 1 defeat while Blokotehna ended up in second place with 9-3 record. Depending on the result of the game between KK Kozuv and BC Academic Bultex 99 on Wednesday evening, the two sides will know who their opponent at the F4 will be. The hosts started well by scoring a lot early but Beroe managed to answer every time that Blokotehna pulled away. Once in the first half the difference reached 10 points but at the break it was just 5, In the third quarter the visitors got going and managed to turn the score in their favour. With 3:30 minutes played Beroe took a single-point advantage as then both sides exchanged baskets. With a 4-0 run to finish the quarter the visitors went up by 3 and thanks to an 11-4 start of the fourth the lead went to 10 points. Until the end Blokotehna tried its best to at least take the match to overtime and cut the deficit to just 1 twice. 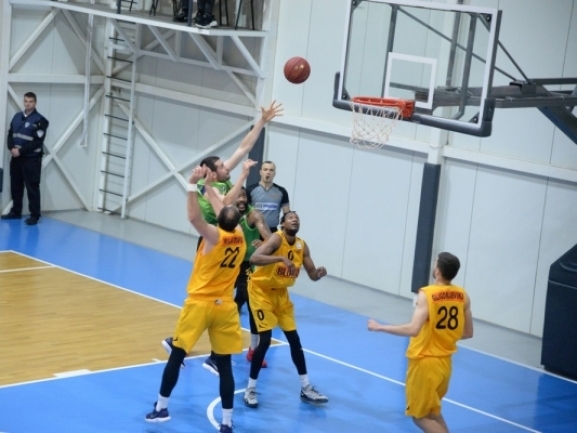 Beroe though kept its cool and answered when it mattered, scored the free throws when it had to and took the victory. Conner Frankamp led the winners with 23 points adding also 5 assists. Paul Miller had one of his best games since joining Beroe finishing with 16 points and 6 rebounds as Nikolay Stoyanov had 15 points and 6 rebounds. Brandon Penn and Danilo Mijatovic were the top scorers for the hosts with 28 points apiece as both also had 7 rebounds each. Marjan Mladenovikj was the next best for the team with 14 points and 7 assists.